Clowning since 1980 with the Chimo Clowns of Winnipeg. 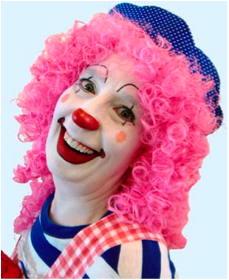 Has taught basic clowning to adults in a classroom setting for 3 years at an Adult Education facility. Attended Clown Camp 2005, 06, 07, and 2009. Involved with establishing LAFS Canada a non-profit organization teaching Life and Fire Safety. Has been awarded a Mark Anthony Scholarship to attend Clown Camp La Crosse Wisconsin.